A world-famous arts festival, an ever-thriving wine trade and a lively student population ensure Avignon isn’t just a showcase of medieval architecture, but a buzzing Provencal center as well. Start at the Palais des Papes, the spot which was once the center of the Western world when the Popes made Avignon their home-away-from-Rome in the 14th century. The forbidding stone walls still exude an air of chilling authority. The palace’s Grand Chapel is an imposing bare space, but if you want decoration, the beautiful chapels of Saint Martial and Saint Jean are where it’s at. Stop in at the Notre Dame des Doms Cathedral with its squat, square spire on your way to the original bridge to nowhere, the Pont d’Avignon (actually Pont St-Bénézet). Dancing optional. The morning is devoted to epoch-hopping art appreciation. Walk along Avignon’s charming winding streets and take your pick from antiquities reflecting Avignon’s Roman roots at the Musée Lapidaire, the Petit Palais, which displays art from the Popes’ Avignonian sojourn, and the Musée Angladon which boasts a Van Gogh among its small but impressive collection concentrating on Post-Impressionists. Then for a complete change of pace, head for the Collection Lambert, whose elegant stone building houses up-to-the-minute contemporary art. In the afternoon, head out to the countryside and its lush lavender bounty beyond the confines of Avignon’s medieval walls. Ah yes, the walls. They’re an attraction in their own right, with exhibits at various points. Spend the morning on these medieval ramparts with their sweeping views of the city within and the countryside beyond. Duck into the narrow streets at will and you might come across the university, founded in 1303, or ecclesiastical treasures along the Promenade des Teinturiers. Finally, enjoy a well-earned rest in the landscaped park on Rocher des Doms, an outcrop which enjoys stunning views of the Rhône and surrounding countryside. Discover one charming Provencal village after another on this 9-hour day trip from Aix-en-Provence. Cliff-top settlements, sprawling vineyards, antique shops and a 12th-century abbey surrounded by lavender fields are just some of the postcard-perfect sights you will encounter. Traveling by air-conditioned luxury minibus, visit the Luberon towns of Lourmarin, Isle-sur-Sorgue, Roussillon and Gordes. Snap memorable photos as an informative guide shares engaging commentary along the way. Immerse yourself in the distinctive beauty of Provence with a full-day tour from Avignon! With your small group, view elegant mansions and local art in Aix-en-Provence before heading to the cliffside town of Moustiers Ste-Marie to catch breathtaking views and peruse signature ceramics. Finish with a visit to Sainte-Croix du Verdon and the limestone peaks of Verdon Gorge, where you can unwind with a lakeside stroll and a refreshing swim. Explore Provence of millennia past on this small-group tour from Avignon. With an expert guide, visit beautifully preserved ancient ruins and hear stories of Roman settlement and culture in southern France. Highlights of your tour include Nîmes' Roman amphitheater and Maison Carrée (Square House), the Fenestrelle Tower in Uzès, and the magnificent Pont du Gard aqueduct – UNESCO-listed site. While in Avignon, treat yourself to a private tour of Rhône Valley wine country! With a personal guide, wind through the lush Provence-Alpes-Côte d’Azur region en route to two esteemed wine estates, where you’ll see traditional winemaking techniques and taste sumptuous wines from crisp rosés in Tavel to an array of world-class reds in Châteauneuf-du-Pape. 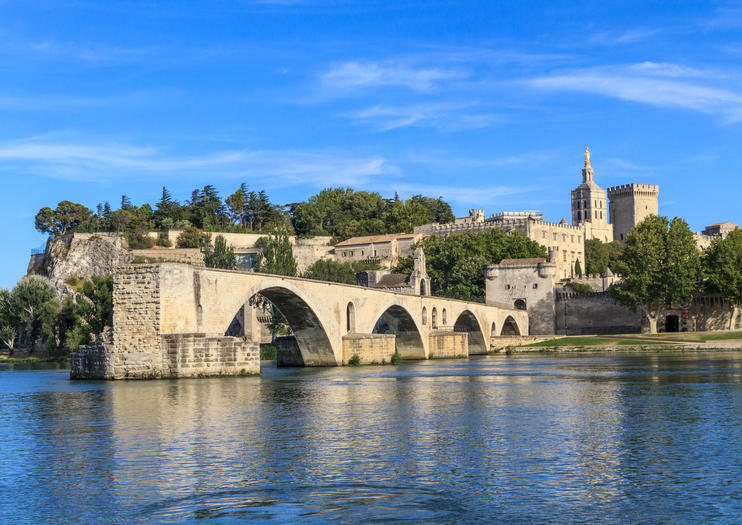 Finish with a historic tour of Avignon including famous sites like the Saint-Bénézet Bridge. The beauty of France has inspired thousands and its Fontaine de Vaucluse is no exception. Embark on a private tour from Avignon to see mythic place where the Sorgue River originates as well as the Isle sur la Sorgue, a charming island city filled with antique shops and art galleries. Poets like Petrarch found the spring source and its wild surrounds simply enchanting—it's likely you will too. Discover the rich traditions and flavors of Rhône Valley wine country on a guided wine-tasting tour from Avignon. With a small group of fellow wine enthusiasts, spend a half day visiting one or two distinguished wine estates in the Châteauneuf-du-Pape territory to sample and learn about local varietals. Your excursion includes fascinating estate tours and intimate tasting sessions in a breathtaking natural setting. Appreciate the exquisite beauty and bounty of rural Provence on a half-day tour of Les Baux-de-Provence from Avignon. Perched in the rocky Alpilles mountains, Les Baux offers panoramic views of the expansive vineyards and olive orchards that blanket the hillside. With your expert guide, visit a local olive mill to sample fine AOC olive oils and see how they're made, then head to a winery in the foothills for an intimate wine-tasting session. Discover the bounty and beauty of Rhône Valley wine country on a guided wine-tasting tour from Avignon. With a small group of fellow wine lovers, spend a full day visiting three esteemed wine estates near Mont Ventoux, Tavel and Châteauneuf-du-Pape. Along the way, explore the lovely town of Beaumes-de-Venise. Meet local vintners and sample wines and olive oils while marveling at the stunning Provençal countryside. Discover Provence’s exotic beauty and ancient roots on a full-day tour of Aigues-Mortes, Camargue and Arles from Avignon. In a small group, travel into the saltwater marshes of Petite Camargue to visit the striking cities of Aigues-Morte and Les Saintes Maries de la Mer and to spy abundant wildlife like herons, flamingos and wild white horses. Then head to UNESCO-listed town of Arles – the city famously captured by Van Gogh in paintings like Le café de nuit. Witness Roman relics and age-old traditions of wine and olive oil making on a full-day tour from Avignon. In Les Baux de Provence, visit a local olive mill to sample fine AOC olive oils and see how they're made, then head to an estate in the Chaîne des Alpilles for a wine-tasting session. Afterward, visit the Roman amphitheater in Nîmes, tour medieval Uzès and view the UNESCO-listed Pont du Gard aqueduct. Make your trip through Provence even more exquisite with a private guide! On this 4-hour tour from Avignon, discover Provence’s lavender fields and perched Luberon villages. Tour the countryside by mini-coach, soaking up the Mediterranean landscape and admiring hilltop castles and expansive vineyards. Visit the picturesque towns of Oppède-le-Vieux, Roussillon or Gordes and learn all about Provence’s signature bloom at the Lavender Museum in Coustellet. Experience the exquisite flavors of the Rhône Valley on this 5-hour wine-tasting tour from Avignon. In a small group, wind through the verdant foothills of Mont Ventoux en route to a distinguished wine estate. Your tasting adventure includes a tour of the estate's lovely vineyards, cellars and fermenting rooms, a sensory lesson in wine-tasting and unique wine flights – including a range of five fine wines.